•	The church is named after the 4th century St Nicholas of Myra. “Cole Abbey” is derived from “coldharbour”, a medieval word for a traveller’s shelter or shelter from the cold. •	The earliest reference to the church is in a letter of Pope Lucius II in 1144-5. •	St Nicholas of Myra is patron saint of, among other groups, children and fishermen, and the church has special ties with both. An inventory of the church’s possessions taken at the time of the Reformation includes vestments for children, suggesting that the church maintained the tradition of electing a boy bishop on St Nicholas Day. •	Deeds in the reign of Richard I refer to a new fish market near St. Nicholas Cole Abbey. In a Charter of 1272, the church is referred to as ‘St Nick’s behind Fish Street’. During the 16th century, several fishmongers were buried here and John Stow records that during the reign of Elizabeth I, a lead and stone cistern, fed by the Thames, was set up against the north wall ‘for the care and commodity of the Fishmongers in and about Old Fish Street’. •	As with all English churches, St. Nicholas Cole Abbey was obliged to conform to Protestant ritual during the Reformation. Upon the accession of Queen Mary I, it was the first church to celebrate Mass on August 23 1553. The incumbent rector, Thomas Sowdley, had obtained a license to marry during the reign of Edward IV and was deprived of his living as a result. •	A century later, the living of St. Nicholas Cole Abbey was owned by Colonel Francis Hacker, a Puritan who commanded the execution detail of Charles I. •	The church was destroyed in the Great Fire and was rebuilt between 1672 and 1678 at a cost of £5042. •	Included in the building accounts are the items: "‘Dinner for Dr Wren and other Company - £2 14s 0d’ and ‘Half a pint of canary for Dr Wren’s coachmen’ – 6d". It was the first church of the fifty-one lost in the Great Fire to be rebuilt. 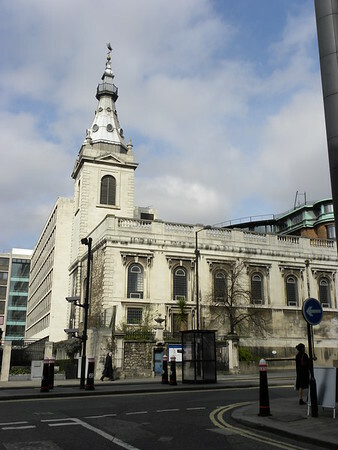 •	The post-Fire church was built with its façade to the north on what was then Fish Street (and what is now Distaff Lane) and the east on Old Fish Street Hill. Victorian urban redevelopment changed the local street plan and the south wall of the church, instead of being hemmed in by buildings now overlooks the newly built Queen Victoria Street. •	This necessitated a reordering of the church, in 1874, with windows being opened up to the south and the main doorway moving from the northwest tower to the south. •	Smoke generated by underground trains so blackened the exterior that in the late 19th century, the church became known as “St. Nicholas Cole Hole Abbey”. •	On May 10, 1941, London suffered its worst air raid during the entire War, with 1,436 people killed and several major buildings destroyed or severely damaged. Among them was St. Nicholas Cole Abbey. The church remained a shell until restored under Arthur Bailey and re-consecrated in 1962. •	The east wall is dominated by three stained glass windows designed by Keith New, who also helped design the stained glass windows of Coventry Cathedral. They replace windows designed by Edward Burne Jones which were destroyed in 1941. From left to right they depict St. Nicholas Cole Abbey as the centre of the world with crosses pointing to the four corners of the world; the Rock of Christ with the ark (representing the church) on four rivers (representing the Gospels); seven lamps, representing the extension of the church around the world. •	Behind a panel near the south door is a medieval stone head found during the restoration. •	The organ was built by Noel Mander for the restored church. •	The spire has two rows of lunettes and a small balcony near the top, resembling a crow's nest. At the very top is a vane in the shape of a three-masted barque in the round. This came from St Michael Queenhithe (demolished 1876) and was added to the spire in 1962. The pre-War vane was in the shape of a pennant with 4 S shapes back to back. •	The tower is 135 feet tall and contains one bell. •	The parish was combined with that of St Andrew by the Wardrobe. •	St. Nicholas Cole Abbey became the headquarters of the Diocesan Council for Mission and Unity. In 2006, the Church of England announced that St. Nicholas Cole Abbey would become a national centre for Religious Education. •	The church was designated a Grade I listed building on 4 January 1950.